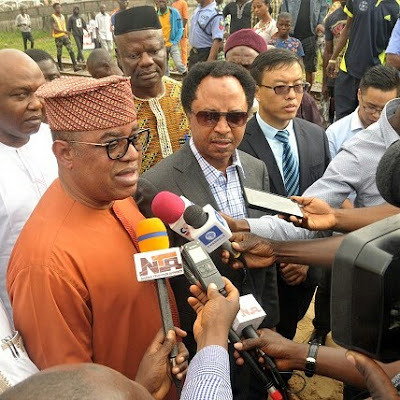 Senator Gbenga Ashafa, the Chairman of the Senate Committee on Land Transport has urged the Federal Ministry of Transport to ensure delivery of standard gauge rail lines and other vital rail infrastructure to Nigerians before 2019. Further to the above, When asked by Senator Ashafa when the Lagos-to Kano Standard gauge railway project would likely be completed and delivered to Nigerians for use, Amaechi responded that initially the plan was for it to be completed by the end of 2018, but the company has stated that due to several technical works to be done it will most likely be by the first quarter of 2019. The session also had in attendance Distinguished Senators Jeremiah Useni, John Owan Enoh, Olanrewaju Tejuoso and Osinakachukwu Ideozu who are members of the committee, while the Ministry of Transportation was ably represented by the Honourable Minister for Transportation Rt. Hon. Chibuike Rotimi Amaechi, the Permanent Secretary Alhaji Sabiu Zakari, the Managing Director of the Nigerian Railway Corporation, Engr. Fidet Okhiria amongst other key members of the ministry. Ashafa also called for synergy between the committee and the Ministry to ensure a speedy passage of the 2018 budget, in line with the sense of urgency demonstrated by the early submission of the 2018 Budget estimates to the National Assembly by His Excellency, President Muhamadu Buhari. He stated that “that this meeting makes it the 2nd time that our Committee would meet with the Honourable Minister and his team in respect of budget defence in 2017. This is due to no other reason but the government’s commitment towards ensuring an early passage of the 2018 Appropriation Bill into law. What this translates to clearly is that there is a renewed sense of urgency in governance and we cannot afford to slow down this process in any way. I would therefore like to begin by imploring all parties to avoid any actions that would delay the appropriation process in any way”. He therefore restated the committee’s determination to ensure that the estimates before them were painstakingly reviewed and also that the committee was prepared to work with the Ministry to arrive at the most realistic estimates in order to present a workable budget. The Minister of Transport RT. HON. Rotimi Amaechi on his part appreciated the support of the Senate Committee on Land transport for their support, understanding and cooperation and assured the committee that they shall work collectively to transform the Land Transport Sub-Sector for the benefit of all Nigerians. He took the committee through the 2017 budget performance of the Ministry and also though the 2018 budget proposals. He explained that priority has been placed on the completion of the ongoing Itakpe-Ajaokuta-Warri-Aladja railway project which commenced 32 years ago and the counter part funding that will be required as Federal Government contribution for the financing of the Ibadan-Kano project and the Nigerian Coastal line Lagos-Calabar project. He also took the committee through new projects that were inserted into the 2018 budget proposal which President Buhari has given approval to the Ministry to source for financiers. These include the new standard guage Rail line from Port-Harcourt to Maiduguri passing through Enugu, Lafis, Makurdi, Gombe with branch lines to Owerri, Onitsha, Awka, Abakaliki, Yola, Jalingo and Damaturu amongst other projects. With the conclusion of the budget defence, the Senate Committee on Land Transport is expected to conduct an oversight visit to the Ministry of Transport.